You can rent 2 or 3 bedrooms in this fabulous home. Please note, we do NOT rent to separate parties at the same time. Standard 2BR Rate shown is $138/night for 2 bedrooms. Rate is $170/night for 3 bedrooms. (If renting 3 bedrooms, owner edits the 2-BR rental quote when you send your inquiry.) Special rates for rentals of 28 days or more: $127/day for 2 bedrooms, $157/day for 3 bedrooms. Holiday/Christmastime rates are $200/night. It's furnished beautifully and comfortably to rigorous rental program specifications (i.e. v-e-r-y comfortable beds!) with quality workmanship throughout. Fabulous water and mountain views from the second floor patio and 3rd floor viewing tower. It's bigger in size than most homes, just steps to the water, pools and hotel. Long-term and snow bird renters welcome. 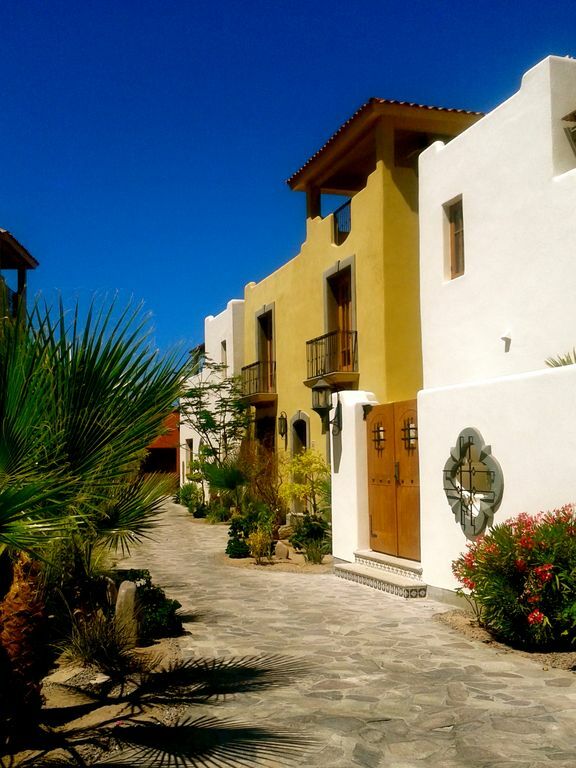 Located near the historical town of Loreto in Baja California Sur, Mexico, Loreto Bay homes offer beauty, relaxation, social and sports activities. The home itself is very spacious and comfortable and decorated in a casual elegant style while incorporating much Mexican artistic detail. We can provide many additional photos by e-mail. The development and home are very modern in conveniences yet you feel you have stepped back in time a bit. You will enjoy the many walking streets (no cars allowed beyond the main street), sport and social activities and beautiful scenery you see everywhere around you. I live in San Diego CA and own a vacation home in Loreto Bay, Baja CA Sur Mexico. My background is teaching. Currently I am a realtor in San Diego County. I am a businesswoman and am very organized. I was born in 1949. I speak Spanish fluently. Loreto Bay is breathtakingly beautiful. The mountains come down to the Sea of Cortez. The development itself has the goal of being ecologically self-sustaining. The homes are architecturally very appealing--my home has a large upstairs patio plus a third floor viewing tower--you can see and enjoy the Sea of Cortez and the mountains from both. There are many sport and social activities available. The town of Loreto is charming. One can enjoy golf, boating, biking, hiking, snorkeling/diving, riding, tennis, kayaking, shelling, windsurfing, wildlife viewing, hunting, sailing, swimming, fitness center/gym, all arranged at the development. In the town of Loreto there are wonderful restaurants, shopping, night life, and many charming historical sites. All 3 bathrooms have double sinks, large shower areas. Tons of books in the community center. On your honor check-out. Wheelchair accessible on main floor only where there are 2 BRs and 2 full baths. This home is very comfortable and spacious. It's at the south end of the development, quiet, just steps to the water and beach, and a 2-minute walk to the Inn where you can swim, sunbathe, visit the restaurants, bar and exercise room. Loreto was beautiful but unfortunately our stay was somewhat frustrating. appliance and locks were not working we pretty much saw the manager everyday to fix something. on the other hand the manager did come promptly when called. and it is a beautiful home. Mexico's power grid is weaker than the US. In this case, there were more renters than the reservation stated, and they were using all the AC units and appliances at the same time in the heat of the summer. The power grid could not handle that much electricity use by so many people. This is the first 'power grid' issue we've ever had. As far as the locks, I believe the renters did not understand how the entry keypads work. This villa was nicely appointed with two lovely decks--the lower large enough to cook and eat meals and the upper covered deck was perfect for viewing the Sea of Cortez and the "Gigantica" mountains at sunset. This villa is located in the ex pat community of Nopola, about 3 miles south of the airport and 6 miles south of the town of Loreto. The community has a handful of restaurants, small bars and tour offices where you can arrange to do tours and also to rent a car. The owner and the property manager were extremely responsive both prior to and during our stay. My husband unfortunately had an accident requiring medical care and the property manager drove us to the local medical clinic on Easter Sunday! We were most grateful that he willingly helped us on this major holiday in Mexico. He also provided translation services for us with the doctor and checked in with us a few days later to see how my husband was doing. He truly went above and beyond. Most enjoyable vacation we've ever taken. Loreto Bay is very quiet, safe and beautiful. The home has everything you would ever need, and lots of space. We are a family of 4, our kids are both college age and we had more room than we could use! We ate at every restaurant in the community and each meal was fantastic, with something for everyone. The pictures don't do the home justice-it's hard to tell just how close you are to the beach. The views from the 2nd and 3rd floor outdoor areas are incredible. The town of Loreto is a quick 10 minute taxi ride. The taxi's are not as reasonable as some other tourist towns in Mexico, but we still did not feel like renting a car was worth it as the taxi's are quick to pick up and reliable. My husband Rick and I rented this property for 3 weeks. We rotated our adult children and grandchildren to stay with us through out our visit. The 3 bedroom home met all of our day to day needs and was well outfitted with all the kitchen items we needed to feed the big crowds. It was a huge treat to be steps away from the beach which made coming and going very convenient All of us enjoyed the viewing tower in the mornings for breakfast. We were able to see whales and dolphins from the tower. In the evenings we sat on the large Terrence to star gaze. We had many wonderful experiences to go home with. There are a few things I do need to mention that were not very enjoyable and that is why I'm rating our experience only 3. The beds were very soft. Half of the adults got sore backs from the beds, myself included, or kept rolling into thier spouses at night. It's hard to enjoy a day in paradise with a sore back. Because we stayed for 3 weeks we did the laudry between the groups of people coming to stay with us. It was surprising to see the stains on the pillows from former renters. It would be nice to have new pillows and double up on the pillow cases. The "under the sink garbage/organic area" needs to be cleaned better in between guests. We took the whole system out to clean the cabinet because the whole house smelled from leeky organics. In conclusion, we enjoyed the rental, it's a beautiful home and the location was perfect. I'm surprised to hear about the beds and mattresses. They are top of the line and comply with Loreto Bay's original rental guidelines. They are 'pillow top' on one side--I will ask the manager to rotate and/or flip. I will I will also check on the condition of the pillows and replace where needed. Great Location - Plenty of room and great for the price. This house is nicely located just a short two minute walk to the sand. The house is large and well equipped for an extended stay. Plenty of dishes, cutlery, cooking implements, basic spices etc...There are lots of seating areas indoors and out but you will definitely want to enjoy the views and beautiful weather from the outdoor areas. The bedrooms are large and beds were very comfortable for us. We were here in mid November and did not need to use the AC. We loved that we could open the windows and doors and enjoy the ocean breezes and fresh air. The upstairs viewing deck was our favorite place to have coffee and watch the sunrise every morning before our walk. Speaking of walks the pathways through this development are wonderful . We took extensive walks almost every morning and evening. Lots of birds and nature and we even had the opportunity to spot a kit fox early one morning. Snorkeling was supurb right from the beach - Lots of fish, star fish, octopus, eel, and even saw a seahorse. We also enjoyed the beach club for drinks and lunch along with the beach chaises. On the paseo you will find several good dining options including a very busy coffee shop and wine bar along with two very small convenience stores that carry basic supplies. If you don't want to leave you can have a taxi drop you off and you can enjoy and get most everything you need right on site. We did rent a car for our two week stay and enjoyed several trips to town, day trips to San Javier, Mulege, La Paz, and Villa Del Palmar for a day pass. There are two decent grocery stores in town and you can find most anything you need. Lots of nice restaurants in town as well and everyone we encountered were so wonderful, helpful. welcoming and friendly. The few downsides were that no one was there to meet us so it took us awhile to figure out where the house was located and where to park (the parking area was closed off) Also could not find anyone to help with luggage when arriving. There were several things in the house that need or will soon need some attention - however the house manager is VERY responsive and the few issues we had were fixed the same day. We also felt that the cleaning could have been better. These however are all very minor issues and all in all this house is wonderful and such a great deal for the price point. I would not hesitate to recommend and rent this home again on my future visits. Three of us stayed at #223 and enjoyed Martha's nicely furnished home. We've stayed in other units before, but the floor plan of Martha's is unique and efficient for our purposes. It would accommodate more people quite nicely. What's terrific is the proximity to the beach, pool and Wine Bar. The parking lot was closed, so we used street parking which made getting provisions in and out more of a chore -- a good reason to use the services of Martha's concierge next time to stock up the place before we arrive. We spent most days out on our boat in the Sea of Cortez, so ending the day in a comfortable and well appointed home is a perfect way to end a perfect day. The house can rent as 2-bedroom or 3-bedroom rental. 2 bedroom rate is $110/night, $95 for 28 days or more, $200 for holidays 3 bedroom is $140/night, $120 for 28 days or more, $200 for holidays.